Roger Epperson in May of 2006. Photo by Scott Hein. It was winter. The last ember of sunset burned in the southwest, a shallow dome of scarlet receding tidally into tones of barn-red above Morgan Territory. Eight miles northwest stood the jagged and black contours of Mt. Diablo’s Summit and North Peak. 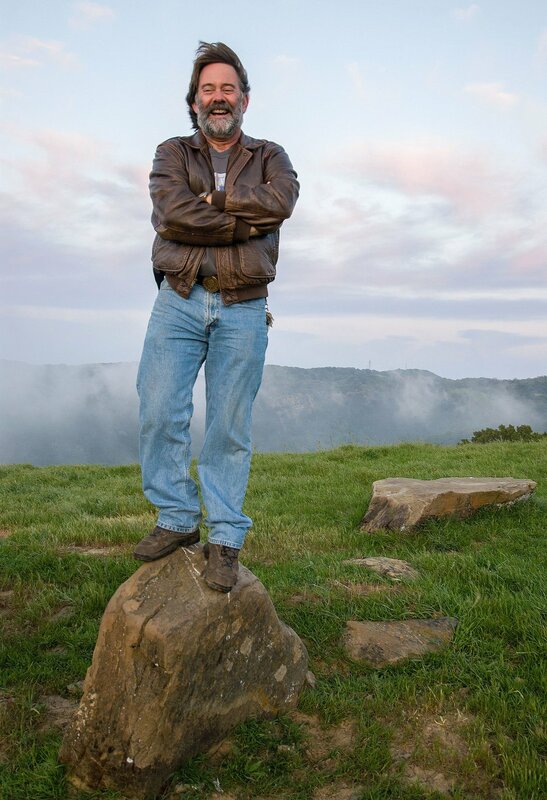 I was standing on the topmost hill in Round Valley Regional Preserve, a place made magnificent through the efforts of a man named Roger Epperson. 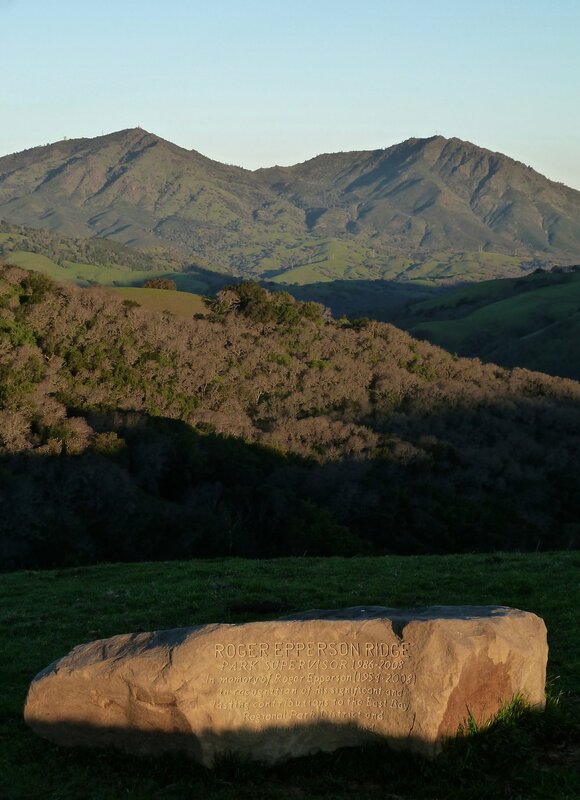 As supervisor of Round Valley, Morgan Territory and Black Diamond Mines regional preserves from 1986 to 2008, Epperson bequeathed a body of work that I and tens of thousands of park-goers enjoy, our attention focused on the beauty – not the vision, skill and persistence that made possible our immersion in the beauty. “To remember Roger on the 10th anniversary of his death,” said Alderdice, “our group of friends went on a campout [in Black Diamond Mines on Dec. 8, the date Epperson died]. We were ready to blame Roger for whatever weather we encountered, hoping for anything other than rain. We got fog. A beautiful, wet, thick fog that blanketed the valley, obscuring the ridge tops. It was magical. By the ’90s, when Doyle began spearheading the EBRPD’s acquisition of land (as assistant general manager for Land and Planning), Epperson was making that land optimal for park-goers. The sanctuaries of beauty we now enjoy were once obscure and inaccessible – right up Epperson’s alley. Roger Epperson in January of 2007. Photo by Bonnie Watkins. “For me, growing up hiking Mt. Diablo, this was a special ‘local yokel’ treat,” said Doyle. “It was our back yard. The fun was always having Roger at my side to explore every nook and cranny of a new property and old barn or other finds. Roger collected reptiles from a young age so he was always turning over rocks and boards to find a new snake or lizard; always carefully putting them back. Epperson’s taste for the obscure wasn’t confined to local landscapes. Jim Rease (aka “Roger’s other wife”) remembers his friend’s attraction to what Rease calls The Good Obscure, whether expressed in a passion for rare cars and motorcycles or rare art forms. “Roger and I had a phase when we went to a lot of hole-in-the-wall Japanese restaurants,” said Rease, “and watched a lot of black-and-white samurai films with subtitles. We wouldn’t go to the multiplex; we’d go to Japantown. “Before we’d take a trip to our favorite parks, Roger would research the back roads – always a very circuitous, less-traveled and scenic route. The routes were as good as the destination. We’d take the longer route – maybe an extra hour and a half – just to discover places along the way. Epperson occupied a special status among his friends. “As our group gathered on the 8th,” said Alderdice, “we all were very aware that it was always Roger who was the glue that held our group together. He had the skill to blend intellectual debate, goofy play, eclectic music, potty humor and naturalist docent at any given gathering. And was he ever funny. Roger never shied away from getting a laugh, even at the expense of his ego. “He was forever changing the words in songs,” Alderdice remembered. “Creedence Clearwater’s ‘There’s a bad moon on the rise’ became ‘There’s a bathroom on the right’ and Counting Crows’ ‘I belong in the service of the Queen’ became ‘I belong in the cervix of the Queen.’ He made eye contact with you when he sang it for the hundredth time – just to make sure you got it. The view from Roger Epperson Ridge, Morgan Territory Regional Preserve. Back at Round Valley, as I watched the final ember of sunset dissolve into dusk, more monuments to this extraordinary man came to mind: the embers that burn in the hearts of his friends, embers that burn long after the flame died, testifying to the light and heat the flame radiated. And so are the palpable monuments of trails, roads, campgrounds and benches where vistas are framed and moments are etched in memory. It’s fitting that Epperson’s friends, to remember his life, roam these places he nurtured. Being out there in that glory is where we feel most alive, and most at peace: these vistas, these moments, enhanced by this man. Peace, Roger. The host led Leia and me to our table. We took our seats. I said “thanks.” The host said “no problem.” I was tempted to tell the host “I’m mighty relieved to hear that leading us to our table was no problem” but I knew Leia would shoot me a glance that could melt iridium. Leia ordered wine; I ordered beer. The server delivered them. Leia said “thanks.” The server said “no problem.” I was tempted to tell the server “that’s fascinating; it never occurred to me that delivering our beverages would be a problem” but I knew my reply would be interrupted by an eyeball-rattling pain to my shin delivered by the point of Leia’s shoe. By the time dinner was done and we breezed through the restaurant’s exit, we’d been treated to an unofficial count of nine “no problem”s. I imagined thanking a Good Samaritan for yanking my car out of the ditch in a sub-zero blizzard. For my sake he missed his once-in-lifetime job interview, subluxated every vertebra in his spine and probably needed several fingers amputated due to frostbite. And I wanted him to know I appreciated it. It’s official: to paraphrase Nietzsche, “you’re welcome” is dead. Is it unreasonable to demand that everyone be aware of the literal meaning of the words they use? Probably. I knew a guy who always greeted me with “hey, baby, what are you doing? !” I’ll never forget his facial expression when, after weeks of replying with “hi,” I gave him a play-by-play account of what I was doing. He looked at me as if I were radioactive. It’s tempting as customers to view service providers’ “no problem” as dismissive and self-centered. “No problem” directs attention to the thanked person, the service person. “You’re welcome” directs it to the thanker, the customer. My personal preference, “my pleasure,” also directs attention to the thankee, but in a genial way: “I take pleasure in doing this for you” (that a problem might be involved is irrelevant and off the table). So what’s the problem with “no problem? Are those who use the phrase being deliberately dismissive and self-centered? No, the problem is: they’re not being anything – but using words that convey meaning anyhow. The possibility that their effort on your behalf might have been a problem is not a thought that fires in their synapses. To them, “no problem” isn’t an attempt at precise communication; it’s an attempt to fill the moment with a social noise. “No problem” could mean “you’re welcome,” “my pleasure,” “no worries,” “whatevs” or “indubitably.” Its true meaning, I suspect, is far less genial. It means “I heard you thank me.” Nothing more. And that’s the problem: We talk like we think. Unexamined language exposes unexamined thought. How many folks who use the phrase “I could care less” (instead of the original and correct “I couldn’t care less”) realize they’re expressing the exact opposite of their intended meaning? How many who use “it’s all downhill from here” as a negative term realize they’re flip-flopping the meaning of the original and correct metaphor (“after a hard slog uphill we get to coast downhill; it’s all good from here”)? Again: the exact opposite of their intended meaning. In a world in which we’re bombarded from every point of the compass by those bent on persuading us to do their bidding – from politicians to advertisers – it’s never unwise to examine the meaning of words. Some social critiques are attempts at promoting change. My riff on “no problem” has no such ambition. Let’s not fool ourselves: the situation’s hopeless. I’m not offended by “no problem” – just disappointed. But it’s only a matter of time before I lose patience and chasten a bewildered restaurant employee with my “no problem” tirade. How to avoid the unavoidable? I should quit dining out.